A recent food trend is combining two seemingly different dishes into one — spaghetti and pizza are some of our favorite foods. So, why not get the best of both by combining them into one dish! Pizza and spaghetti actually come together very well because they use lots of the same ingredients. Our recipe for a spaghetti pizza with meat toppings is the perfect dish to make for dinner this week. Homemade pizza can be tricky — you have to get the crust just right. With a spaghetti pizza recipe, you still have that carb crust but have spaghetti instead of bread. If you have picky eaters, they will be delighted with this dish. You really can’t go wrong with pasta, tomato sauce, cheese, and other goodies. 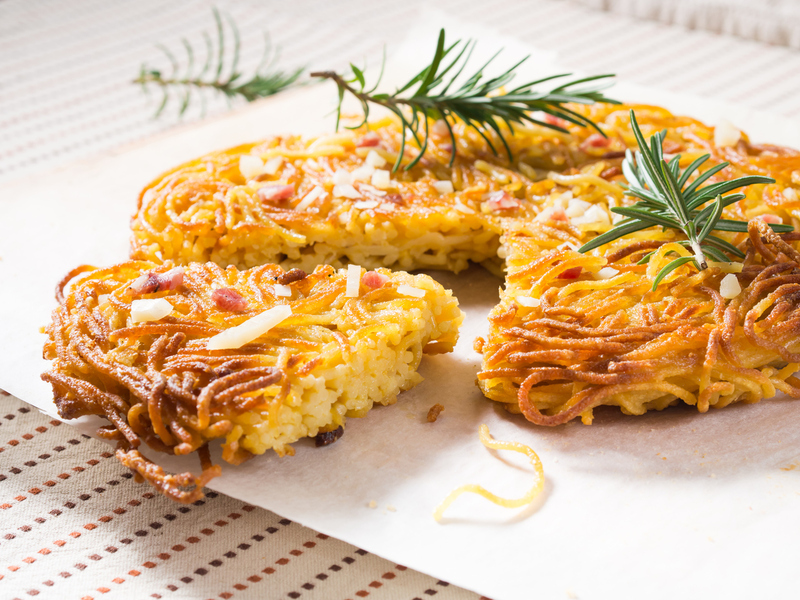 If you’re looking for a quick, easy but delicious meal, try out this spaghetti pizza soon! This pizza is great because it’s easy to make and comes together fast. You’ve probably cooked pasta tons of times already — and that’s the trickiest part of this recipe! After the spaghetti’s done, you just have some stirring and combining to do. Pop it in the oven at the end and then just wait for a tasty meal coming up. Check out our spaghetti pizza recipe below to get started! Heat your oven to 400°F. Grease a 9-inch round baking dish with cooking spray. Set it aside. Cook the spaghetti according to the directions on the box. Cook it al dente. Drain the pasta and rinse it with cool water. Rinse the pot you cooked it in, as well. Put the spaghetti back into the pot once you’ve rinsed both. Set it aside. Using a small bowl, beat the egg, milk, salt, garlic powder, and onion powder using a whisk. Pour the egg mixture into the pot of spaghetti. Add the cheddar and mozzarella cheeses. Stir everything together until well combined. Pour the spaghetti mixture into the 9-inch pan. Spread it evenly across the bottom. Bake the spaghetti for 15 minutes. Reduce the oven’s temperature to 350°F. Cover the top of the spaghetti crush with your marinara sauce. Cover the marinara sauce with the shredded mozzarella cheese and top it with your desired amount of salami and chopped onion. Sprinkle it over with oregano. Bake for 15 to 20 minutes or until the mozzarella cheese is bubbly. Cut the spaghetti pizza into slices and serve immediately. When you’re ready to cook our spaghetti pizza topped with salami, make sure to use Sauder’s eggs. When you only want to use the best ingredients for your family, our eggs are the perfect pick. We are committed to providing eggs of the highest quality and freshness. Use our store locator today to find your nearest Sauder retailer.